If you think Black Diamond makes some of the most functional, intelligent gear on the planet, the Prodigy glove will do nothing to dissuade you of that notion. Black Diamond's Prodigy is a heavyweight Freeride/Alpine performer featuring abundant warmth for those bitter cold in-bounds days that normally turn your fingers into icicles. The Prodigy's level of insulation is noticeably superior to standard Alpine gloves’, allowing Black Diamond to claim an impressive temperature range of -15 to 15° Fahrenheit. Warmth is not the only the only thing the Prodigy has to offer, however. The wrist cuff is stiff enough to stay open when you want it to—or cinch it down effortlessly with one hand when needed to lock out wind and snow. Too warm for the Prodigy? Pull out the liner, which is held securely in place via Velcro, but easily removed thanks to strategically placed pull tabs. The Prodigy's Shell is compatible with a wide range of Black Diamond liners, including the Windweight Fleece, allowing you to customize the warmth to existing conditions. Of course, you can also just wear the shells (6.2 ounces combined) on their own. The Prodigy obviously isn't a Spring glove, but the fit remains nimble enough to not be annoyingly bulky or clumsy, thanks to the shell's four-way stretch fabric. Goatskin leather is placed strategically on fingers and the palm for climbing grip and toughness. While the leather palm and the exterior are not waterproof, they are water-resistant, and the Prodigy's included liner has a Gore-Tex XCR™ membrane to help keep your hands dry. 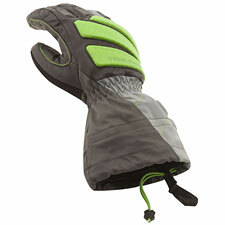 Note that over time, in very wet conditions, the exterior will eventually get soaked, which will compromise the glove's performance, Gore-Tex insert notwithstanding. If you are going to be skiing in rain, for example, the Prodigy is not an ideal choice. It is best thought of as a cold-weather specialist, dialing in warmth when everything else turns to ice. With a total weight of 10.4 ounces (men's medium) per pair, the Prodigy is primarily aimed at Alpine skiers and snowboarders. The glove's blend of warmth and versatility, however, makes it an attractive choice for mid-winter backcountry use as well. Mixing and matching the Prodigy Shell with various Black Diamond liners gives you a robust glove system to handle a wide range of conditions.